OVA "xxxHOLiC Rou" is set 10 years after Watanuki's part-timer years in the anime series. The story begins with Ghibli-evil-assimilation-like disappearance of Yuuko, whether a dream or reminiscence, we are not certain. Watanuki makes a promise that he will wait for her return, and that he believes dream will come true as long as he believes in it. Watanuki was the new master at the 'shop' when he opens his eyes. No longer a jumpy and clumsy high school kid, Watanuki has an air of authority and confidence. However, there's the same care-free atmosphere in the 'shop' with Maru, Moro, and Mokona running around the house, and his role as the cook has not changed. Doumeki is now an assistant professor at nearby university, but runs errands and goes on missions on behalf of the 'shop' (like Watanuki in his high school days), but still shows Watanuki no respect. From what I've read in Japanese blogs, the setting is similar to manga, except more time has passed. The story in "xxxHOLiC Rou" is about a request for a mission brought by Doumeki to find a hidden relic in an old mansion. Animation has not improved much from the previous OVA, but character proportions are much more realistic compared to "Kei", and much easier on my eyes. Music was very nice, and effectively used to create the eerie and suspenseful mood in certain scenes. Voice acting, once again, is very well done. Although the technical aspects of this OVA definitely lacked the wow-factor, it was incredibly well-directed. The pace and the setting was clearly established in about 10 minutes, and the plot flowed wonderfully to the very end. A number of poignant moments between Watanuki and Doumeki are abruptly interrupted by Mokona or Maru/Moko, which carries the thought to the ending, which was an 'interpret-by-yourself' conclusion. The OVA had a true Japanese cinema feel with excellent use of silence and pauses, as well as effective utilization of camera footage taken by Doumeki and viewing by Watanuki to advance the story. I have not been following the manga series, but the setting of "xxxHOLiC Rou" was very easy to follow (although it raises a lot of questions to Yuuko's disappearance and what happened in the last 10 years). The mission this time is an unremarkable one, but it's themed around Yuuko's return, and a showcase of 'how the ship is ran' by Watanuki's as the 'shop' master. Once again, there is a lot of Japanese mythical references that were very interesting if you're into that stuff. The characters weren't given much space for development in the actual show, but it is rather a display of how the characters had developed in the 10 years without Yuuko. Character depiction was done exceptionally well as a half-feature-length-OVA. Unlike the previous disappointing OVA "Shunmuki", "xxxHOLiC Rou" is nearly a flawless episode that uses the 40-minute run time very efficiently and a story well told. It doesn't necessarily bring a closure to the "xxxHOLiC" series or the "Rou" story arc, but I personally think it would serve as an excellent precursor and intro for another season of "xxxHOLiC" series since it really stirred my curiosity to events transpired in 10 years, and made me crave for more. The second OVA episode is titled 'Adayume' (Empty Dream). This time, the mission is brought in Watanuki's dream by Doumeki's grandfather Haruka, who appeared in 'xxxHOLiC Shunmuki' OVA. The premise is still the same as the previous episode, most of the play duration takes place in the dream that Haruka wants Watanuki to change, and follows a series of past events from Doumeki's perspective. Once again, it's pretty heavy on folklore with references to Baku, the dream eater, and Houjou Masako, who is said to have purchased her sister's dream to become the shogun's wife (her sister could not interpret the dream). The second episode felt a bit lacking, both in length and depth to the story, but it has some nostalgia value in revisiting past events. There is also an upcoming conflict foreshadowed by Yuuko, so perhaps there will be more episodes. 'Adayume' have only added more questions what happened in 10 years' time. It'll be interesting to see how everything will be summed up. So my format I set this out in is that if I skip a line, that means its a new paragraph. If I have a new line, its the same topic; just a different point. and.....I might include spoilers without me knowing it so.....As a precaution, I'll apologise now. So the story takes place 10 years after yuko's 'death' or 'disappearance' and it show how much the characters have changed. Hiwamari is married, doumeki is a professor and kohane is a student in the same university.This setting is the same as the manga yet the story is well, a side story since there isn't anything like this in the manga. So a brief summary of the plot would be doumeki and another professor going to a mansion-like house to check out some artifacs and charms.etc. And when doumeki was there, he meets a girl, who is unnamed, an rather mysterious too. And then the next time they went, they were going through a crate and inside that crate was a bell. and once the bell was rung, the bashes open a door and starts acting all berserk and bites the professor and causes havoc. doumeki and watanaki investigate further to find shes some izura tamer or something like that. The storyline confused me. So a girls gets possesed, and then destroys everything and then a pipe fox comes to the rescue, and they find a box and then she turns into a fox?! It was just too much to keep up with. And I'm the person, whho judges alot of anime and manga by endings. A bad and incomplete or rushed ending ruins the anime no matter how good the storyline was. xxxHolic rou's ending was confusing as well. What happened to an equal payment? How could a few words be enough for a girl to turn into a fox? What happened to yuko? The ending wasn't rushed, I was just incomplete. I felt like it needed more episodes. The storyline was the only thing that ruined it for me. And it was such a shame because this could've turned out really good. But thats just me. Maybe your not as absent minded as me and you might understand the storyline. 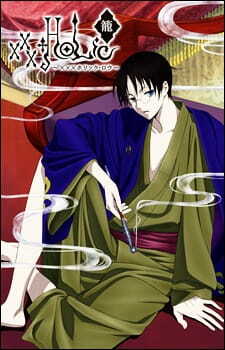 The art was the usual xxxholic style art, the simple eyes, and matte colours. Kohane grew taller and looks a lot more mature, yet doumeki hasn't changed, nor has watanuki since those ten years. Apart from that, the art was brilliant. The music, was outstanding. It created the right atmosphere and setting. If your were to watch this anime on mute, you might not even realise that this anime is horror. The character development was probably the things that stand out the most. Kohane is a (half) carefree girl and she is no longer the insecure child she was before. Although doumeki......hasn't changed at all. He's still the demanding, emotionless type of guy. But on the other hand, watanaki has changed dramatically. He's become alot like the serious yuko. (and when I said serious yuko I mean when she's around her customers and has that eerie demeanour not the playful sake ridden one) He no longer spazzes and no longer does those overly dramatic reactions that I love. Instead, he smokes a pipe and takes in a very serene tone and formal yet demanding manner. This anime or ova was different, from all the other xxxholic ovas out there because it has a different setting to it. I enjoyed it,even though i didn't get it, and that's pretty impressive. I'm gonna end this awfully long review with this oh-so spoilerish line. Alright I'm back with another review with this anime again. This OVA is even better than xxxHOLic, xxxHOLic Kei, xxxHOLic movie, and xxxHOLic shunmuki ( a bit good but not better than Rou). Major spoiler!!! You have been warned!! Story (9/10): Okay so the story is pretty much rushed BUT it's awesome. The story took place 10 years later and I actually want to know what happened and I hope it show in the manga because I'll be reading it soon. I was really confused to as what happened to Yuuko when she says something about her already being dead and her disappearance. After her being gone, Watanuki became the owner which is cool. Watanuki in this timeline is even better than he was in the first and second season of the anime no doubt but his relationship between Doumeki hasn't changed. Now the bad and most horrible part in this OVA is that Himawari is married to a different man which is very surprising and sad because despite what Watanuki did to her she decided to go for a different man and want to make me realize how the crap did the man did to Himawari to fall for him. One thing came to mind is his looks and I think that's pretty much the reason but I can't be sure. Okay next is Doumeki, you won't believe this but he's actually getting marry too. Oh yeah he is in two months and that person is Tsuyuri. Holy sh**!! I'm shocked!!! Why them and can't be Watanuki???!! Well I just hope maybe Watanuki gets to meet Yuuko and be together in the manga. Character (10/10): Great characters. They're grown and has changed since 10 years went by. Enjoymant (9/10): Of course this wouldn't happened if I knew exactly how and when did Himawari got married and met him and Doumeki relationship with Tsuyuri. Overall (9/10): It's a magnificent OVA. I truly enjoyed it at last. If you did watch the first and second season of this, then I suggest you watch this awesome piece of work. this sequel show us what happens after yuuko disappear for some unknown reason, and also give us a new prospective of how things are now that she is gone and watanuki who takes over the shop, as he seems more matured and focused on what he does this anime in particular is without a doubt a masterpiece which give us a piece of what one should pay for what one wants and also show that if u believe in that illusion of yours it may be able to come true and also that "there are no such things as coincidence in this life but the inevitable"